NOUN: Either of two woodpeckers (Picoides arcticus or P. tridactylus) of northern North America, lacking the inner hind toe on each foot. Since Hairy Woodpeckers can have barred backs in the Maritimes provinces and Rocky Mountain Three-toed Woodpeckers have entirely white backs, it is best to concentrate on the barred flanks, much darker face, and narrow postocular stripe of the Three-toed Woodpecker there. 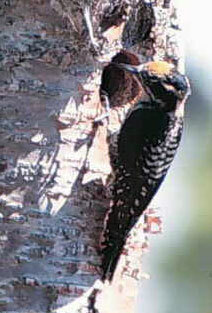 Black-backed Woodpecker is distinguished from the Three-toed Woodpecker by the entirely black back, postocular stripe which does not extend down neck, and wholly white outer tail feathers.